Two new direct-to-consumer paint companies are shaking up the industry and making us rethink the way we approach painting our homes. Although we must admit—there is an element of excitement in seeing an array of colorful paint chips lining the wall of your local hardware store or paint distributor—selecting a hue can be an overwhelming experience for even the most color-savvy among us. Consumers have shopped for paint in pretty much the same way for practically forever—however two new direct-to-consumer companies are set to disrupt this multibillion-dollar industry. The most fascinating part? Their fresh outlook makes so much sense that we're left wondering why no one thought of this before. Backdrop has also redesigned the paint can. Their design is beautiful, ergonomic, and easy to carry. Plus, the paint container can be easily opened without a tool. 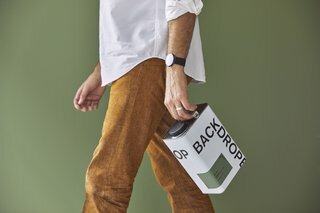 Backdrop was founded by husband-and-wife team Natalie and Caleb Ebel, who first had the idea for a direct-to-consumer paint business back in 2016. However, it wasn't until after the birth of their first child in 2017 that they realized the need for a major change in the way people shop for paint. When Natalie set out to paint their nursery white, she realized that what should have been a super simple process was, "way more difficult than ordering a rug online directly from Morocco." The couple revisited their business idea, launching the company in the fall of 2018. "Our approach is one of simplicity and empowerment and serving the customer the way we wanted to be served as consumers," explains Natalie, "instead of 350 whites, we have five whites." 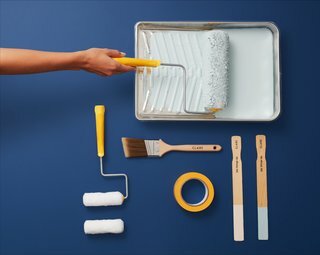 The Backdrop Essential kit has everything needed to paint a room. Caleb, who was an early employee at Warby Parker, knew that the business model would apply well to paint. "The direct-to-consumer model is the best way to interact and build an engaging brand with the modern consumer," he explains. 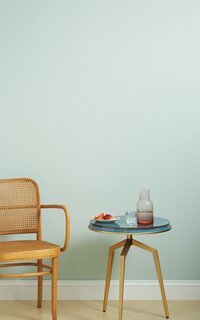 Backdrop offers a curated collection of 50 paint colors in two finishes—all with clever names like "Surf Camp" and "Harajuku Morning." For $2 you can order a 12" x 12" adhesive sample to test out on your wall. One gallon of their standard paint will only set you back $45—an average price for the industry. 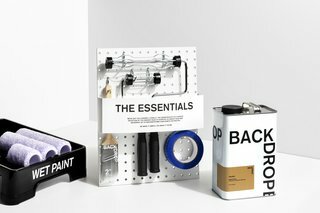 You can also order an 11-piece essential toolkit for $40—encouraging motivation for novice DIY-ers. 12" x 12" premium adhesive sample swatches can be ordered online, allowing you to preview a large color footprint. Natalie recommends putting the swatches on corners to see the depth of shadow. 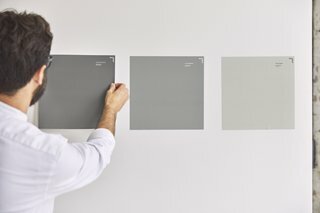 Backdrop offers 50 curated shades for customers to choose from. The low-VOC, low-odor paint is Greenwise certified. The company's beautiful modern branding is a result of a collaboration with the forward-thinking creative agency Aruliden. "From a design perspective this was a chance to help create a brand that we would want to live with," explains Aruliden co-founder and CEO, Rinat Aruh. They even did away with the traditional paint canister. "It was an opportunity to do something fresh and different. These are paint cans that don’t need to live in the basement anymore," says Aruh. Backdrop has also partnered with The International Refugee Committee, a non-profit that supports refugees and aids in their survival and recovery. A portion of all sales helps support displaced families in crisis—an appropriate pairing for a company that helps others transform their own homes. Clare's ultra-premium zero-VOC paint is Greenguard Gold certified for low chemical emissions. The shade shown here, Headspace, is one of their bestsellers. Clare's founder, Nicole Gibbons, worked in public relations for years before starting a decor blog and an interior design business as a side hustle in 2008. Soon, she found herself designing full time, and before long she had her own show on the Oprah Network. Inspired by Martha Stewart, Gibbons knew that she wanted to develop her own brand and she was always thinking about what physical product she could create. In 2016, she finally had that light-bulb moment. After working with painters, architects, and homeowners every day, Gibbons realized that picking a paint color was a very frustrating process for the average person. "In my design career, no one questioned my choices because they trusted me," she explains, "I wanted to bring that design guidance to the process to help people have an easier time. The traditional paint market has way too many colors and product lines—it's an overwhelming selection. I wanted to curate only the best." Clare's 8" x 8" peel-and-stick color swatches help with the decision-making process. Gibbons was able to raise $2 million in financing and she launched her company in July 2018. Her A-list investors include: Imaginary Ventures (Net-a-Porter founder Natalie Massenet's venture capital firm), angel investors Neil Parikh and Luke Sherwin (the co-founders of Casper), and Harry's co-founders Jeff Raider and Andy Katz-Mayfield (Raider was also a co-founder of Warby Parker). Clare's specially-engineered five-piece starter toolkit goes for $25 and includes Japanese washi tape. Knowing that not everyone can afford the luxury of working with an interior designer, Gibbons devised a handy online tool called the "Clare Color Genius." It offers a digital color consultation that's "like having an Interior Designer guide you through the process," she explains. "It looks at all the things an interior designer would asses and pairs that with a high-tech algorithm we developed to help with the color choice process." 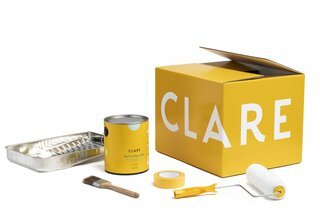 Clare's sleek modern packaging has a strong visual appeal. 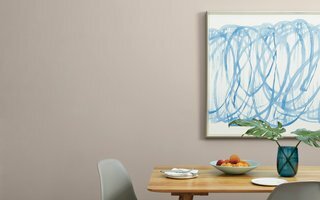 Clare offers 55 curated colors in two finishes for $49 per gallon and provides 8" x 8" peel-and-stick color swatches for $2. They have also designed tools that are specially engineered to give top-notch results, "even if you’ve never held a paint roller before," explains Gibbons. As a design professional, Clare's founder Nicole Gibbons wanted to create a top-quality premium paint. "I believe the prospect of decorating your home should be inspiring and fun—shopping for paint has always been anything but," says Gibbons. "Our philosophy is to try to make that process easier and help customers make the best possible choice for their home."